ENS integration in an application encompasses several critical features, each of which can be implemented independently. While comprehensive ENS integration is ideal, even basic support can be a huge benefit to users. 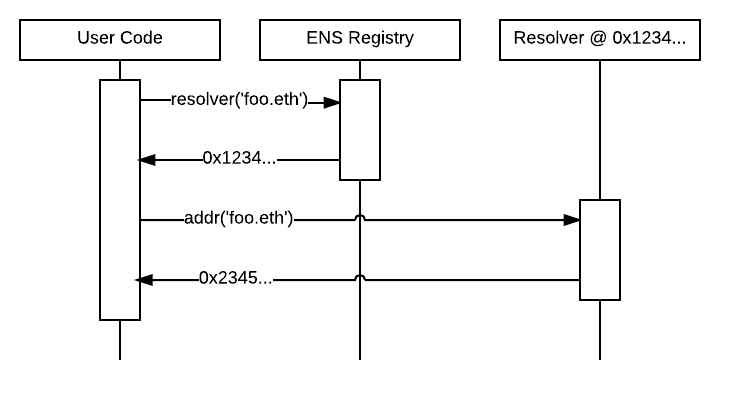 Below, we outline the three main ways you can add ENS support to your application, starting with the simplest and highest impact. The first step to supporting ENS in your application is making your application understand ENS names, and accepting them anywhere an address is accepted. To understand how to do this, see Resolving Names. If possible, when a user enters an ENS name instead of an address, remember the ENS name, not the address it currently resolves to. This makes it possible for users to update their ENS names and have applications they used the name in automatically resolve to the new address, in the same way that you would expect your browser to automatically direct you to the new IP address if a site you use changes servers. If your application deals with user funds or other critical resources, you may want to keep track of the address a name resolves to and warn them when it changes, to ensure they are aware of the change. The second step is to display ENS names wherever your app currently displays addresses. If a user entered an ENS name in step 1, you should retain this name and show it to them whenever you would normally show the address. If a user entered an address, or the address was obtained from elsewhere, you may still be able to show an ENS name, by doing Reverse Resolution. This permits you to find the canonical name for an address and display that when possible. If no canonical name is provided, your application can fall back to displaying the address as it did previously. Providing users with an easy way to register an ENS name and associate it with their resources (eg, wallet address); see Writing a registrar. Providing users with an easy way to update a name they own to point at your application’s resources; see Updating ENS records. The following sections describe how to interact with ENS directly. Chances are, there is already an ENS library for your language of choice, that will do the heavy lifting for you. To find one, see ENS Library support. Normalise and hash the name you want to resolve (see Namehash). Query the ENS registry for the address of the resolver responsible for the name. Query the resolver for the resource you want to look up. To query the registry, call the resolver(bytes32) method on the ENS registry contract (see ENS on Ethereum for details on where to find the registry), passing it the namehash of the normalised name you are querying for. The registry will return the address of the resolver responsible for that name, or 0 if no resolver is configured or the name does not exist. If the registry returned a nonzero resolver address, you can then query the resolver for the resource you want to resolve. For instance, to look up the Ethereum address associated with the name, you would call the resolver’s addr(bytes32) method, again passing in the namehash. The resolver will then return the resource requested, if it’s available. A list of currently recognised resource types are defined in EIP137, but you can also define your own if you need. For details on how to do that, see Writing a resolver. In addition to mapping names to resources (forward resolution), ENS also supports mapping from addresses to names and other metadata (reverse resolution). Reverse records are named <ethereum address>.addr.reverse - for instance, the official registry would have its reverse records at 314159265dd8dbb310642f98f50c066173c1259b.addr.reverse . Reverse resolution follows the same three-step process as forward resolution; the only change is that the name you are resolving has the special format defined above. To find the canonical name for an address, then, you would first query the ENS registry for the resolver responsible for (address).addr.reverse , then call name(bytes32) on that resolver in order to obtain its canonical name. addr.reverse has a registrar with claim(address) , claimWithResolver(address, address) , and setName(string) functions. External accounts can also call this function to claim ownership of their reverse record. For simplicity, the setName(string) function permits claiming a record and configuring a canonical name all in one step. supportsInterface must also return true for the interfaceID value 0x01ffc9a7 , which is the interface ID of supportsInterface itself. Additionally, the content() interface is currently used as a defacto standard for Swarm hashes, pending standardisation, and has an interface ID of 0xd8389dc5 . This trivial resolver always returns its own address as answer to all queries. Practical resolvers may use any mechanism they wish to determine what results to return, though they should be constant , and should minimise gas usage wherever possible. NOTE: If you are resolving addr() records, you MUST treat a return value from the resolver of 0x00…00 as that record being unset. Failing to do so could result in users accidentally sending funds to the null address if they have configured a resolver in ENS, but not set the resolver record! You may wish to set custom rules for the allocation of new names to your users; the rules you set are entirely up to you. You should also bear in mind that as long as you retain ownership of the parent name - either directly or through another contract - your users have no guarantee that you will not take back ownership of their names and change what they resolve to. You may wish to consider committing ownership of the name to a contract that restricts your ability to control it. For an example of this, see ENSNow. Call the appropriate update method on the resolver. Steps 1 and 2 are the same as in Resolving Names. If step 2 fails to return a valid resolver address, you will need to inform your user and offer them alternatives - for instance, you can check if they own the name in question, and if they do, offer to configure a default resolver for them by calling setResolver on the ENS registry. In step 3, call the method defined by the resolver profile - standard profiles are listed in EIP137. For instance, to set the address associated with the name, call setAddr(bytes32, address) , passing in the name hash of the name to update and the address you wish it to point to. Names in ENS are represented as 32 byte hashes, rather than as plain text. This simplifies processing and storage, while permitting arbitrary length domain names, and preserves the privacy of names onchain. The algorithm used to translate domain names into hashes is called namehash. The Namehash algorithm is defined in EIP137. In order to preserve the hierarchal nature of names, namehash is defined recursively, making it possible to derive the hash of a subdomain from the namehash of the parent domain and the name or hash of the subdomain label. domain - the complete, human-readable form of a name; eg, ‘vitalik.wallet.eth’ . label - a single component of a domain; eg, ‘vitalik’ , ‘wallet’ , or ‘eth’ . A label may not contain a period (‘.’). label hash - the output of the keccak-256 function applied to a label; eg, keccak256(‘eth’) = 0x4f5b812789fc606be1b3b16908db13fc7a9adf7ca72641f84d75b47069d3d7f0 . Before a name can be converted to a node hash using Namehash, the name must first be normalised and checked for validity - for instance, converting fOO.eth into foo.eth , and prohibiting names containing forbidden characters such as underscores. It is crucial that all applications follow the same set of rules for normalisation and validation, as otherwise two users entering the same name on different systems may resolve the same human-readable name into two different ENS names. Applications using ENS and processing human-readable names must follow UTS46 for normalisation and validation. Processing should be done with non-transitional rules, and with UseSTD3ASCIIRules=true .